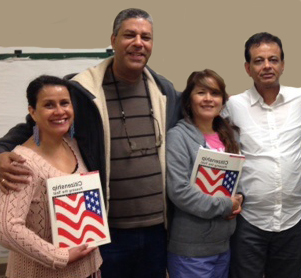 LVMC provides FREE English as a Second Language and Basic Literacy instruction to nearly 500 adult students. Our students are all over the age of 18, representing 70 different countries. Approximately 85% of our students are in our ESL program and looking for help with listening and speaking skills. 15% of our students speak English and are looking for help with reading, writing and/or basic math. You will have a chance to indicate what type of student you’d like to help (ESL or Adult Literacy). Where and when do I meet my student? Tutors and students must meet in a public place such as a library or coffee shop. Matches will be made based on tutor and student preferences for times, days, and locations. Once the initial match is made, tutors will be asked to arrange a meeting place and time. LVMC will be a happy to make recommendations for meeting places in your area. No. Tutors are not required to speak their student’s native language. Students with very limited English typically have a contact person that speaks English to help with setting up first meetings. If you need help communicating with your student, please call our office. The letters ESL stand for English as a Second Language. More than half of our students are ESL students – meaning English is not their first language. What happens when I need to leave town or go on vacation? Our goal is for our students and tutors to meet regularly for one year. However, we do recognize that vacations, illnesses, and other obligations may get in the way. Some tutors and students chose to have extra homework or to email during extended absences. If you know you will be traveling extensively or have variable work hours, please let the LVMC staff know about your schedule in advance so that we can match you with that in mind. I speak English with an accent; can I become a tutor? We require our tutors speak English fluently. As long as you speak English well and can be easily understood, you can become a tutor. Where can I get materials to use for tutoring? LVMC has an extensive lending library with Adult ESL, Grammar, Reading, Writing and Math materials. Tutors are welcome to borrow several books at once. Our website also provides a list of recommended online resources to help with tutoring. In addition, our staff is always happy to help recommend materials that will support your tutoring efforts. Tutors are responsible for materials. Do not write in books or lend them to your student (you can use our copier). Unfortunately, our students don’t have a great track record for returning our materials. How long can I borrow LVMC text books? Tutors may check out books for up to 2 months. If you find that you are no longer using a book, please return it promptly so that other tutors may borrow the materials. How much preparation time is required each week? We recommend that tutors prepare a lesson prior to their tutoring sessions. Depending on your student’s needs this may take 15 minutes or 60 minutes. You can find prepared lessons on our website, and in our library. What do I do if my student is frequently late or misses a class? Please remember to inform the library if you will not be using their space for tutoring on a given week. If your student is frequently absent, please call our office. Can I drive my student to class or on a field trip? No. Our policy is that tutors and students do not drive each other to or from classes. Sometimes students and tutors will meet at a location, such as a local historical site or grocery store, for a field trip. My student gave me a gift. Can I accept it? Yes. Occasionally students will present gifts to tutors to express their gratitude. Some tutors choose to purchase materials with gift cards that will support their tutoring efforts. I have completed one year of tutoring with my student. Can we continue? Yes, many of our tutors and students exceed the one year commitment. The one year mark gives tutors and students the opportunity to evaluate whether or not they wish to continue with the tutoring program. Please speak to our staff, if you have specific questions about continuing or terminating your match. My student hasn’t expressed a specific goal. How do I know what to teach? Many of our materials offer comprehensive lessons on a variety of topics. Ask your student to help prioritize which topics interest them most. Many of our beginning students need repetitive instruction on survival skills – communicating personal information, calendars, money, shopping, etc. You can also ask your student to keep a diary of difficult English words, phrases, or expressions that they encounter between your sessions. Addressing these needs makes tutoring even more valuable. How can I encourage my student to practice speaking English outside of the tutoring session? Create a speaking plan with your student at the end of each lesson. Discuss how, when and where your student can practice their new skills. You can encourage your student to watch TV or listen to the radio in English. Ask them to try speaking English for 5 minutes a day and then increase that amount each week. Please be understanding that many of our students have busy lives with multiple jobs and family obligations. Often they do not feel comfortable speaking English to their family members, who may or may not be supportive of their efforts. We recommend that students have some type of practice opportunity at home between sessions. This could be a small writing or speaking assignment that reinforces concepts discussed in your tutoring hour. For students preparing for high school equivalency tests or entrance exams, you may wish to assign an essay or math pages, as this will be expected of them in their future endeavors.